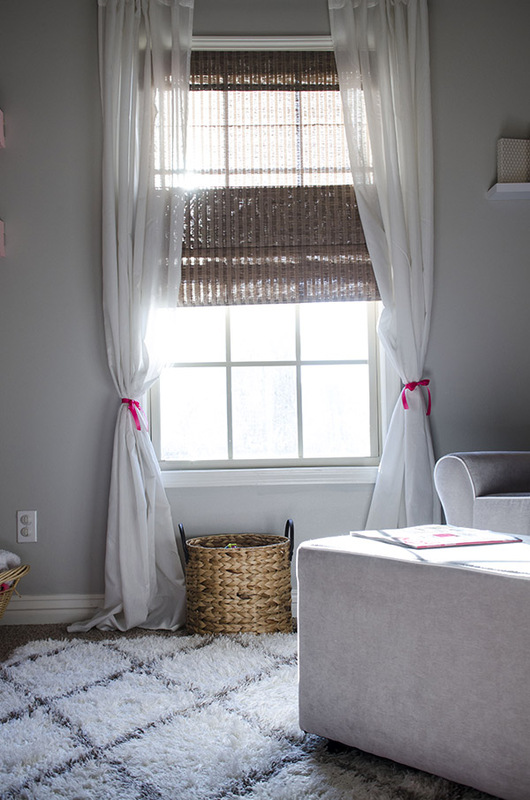 A nursery is a fun room to design and decorate! Our little lady is... you know, THREE MONTHS old now, so I thought I'd share her bedroom with the Internet. It's one of my favorite places in our home. I didn't necessarily go with a theme in her room like animals or flowers. But instead, we kept things cohesive by repeating colors and patterns. Mostly in two or three shades of pink with pops of turquoise and yellow. The "neutrals" in the room are white, cream, and gold. I decided to use cream in the room to warm it up a bit and to help tie in some of the more vintage, non-typical nursery items that we used. As for over the crib, I kept it pretty simple. 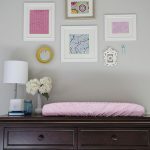 The fabric and ribbon banner was an easy DIY and a great way to bring the colors and patterns from the gallery wall to the other side of the room. The letters are chip board, so super light weight. They are attached with heavy duty command strips. 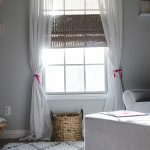 Simple ribbons on the curtains as tie-backs are an easy way to bring in more color and help the eye travel around the room easily. I'm a fan of the extra long curtains that pile on the floor. I love using this adorable basket to keep her little toys in. 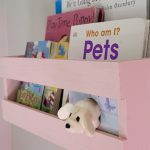 This "B" bow holder was an easy DIY that I had my oldest son help me make. 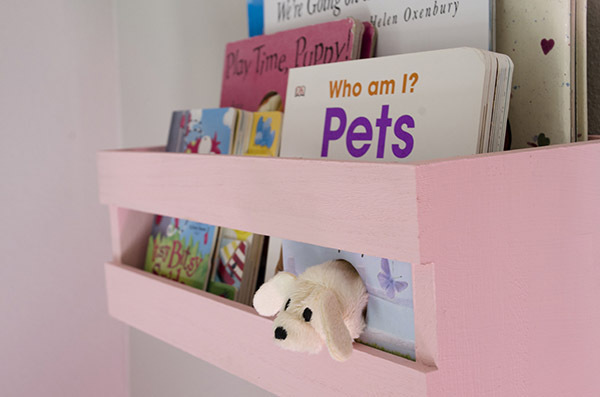 We just painted the craft wood a shade of pink. Then we used spray glue to adhere a pretty piece of scrapbook paper and then we added the painted "B" with hot glue. We also just hot glued the cream ribbon to the back of the board. I sealed the ends of the ribbon by quickly running a lighter across the bottom, this way they won't fray. 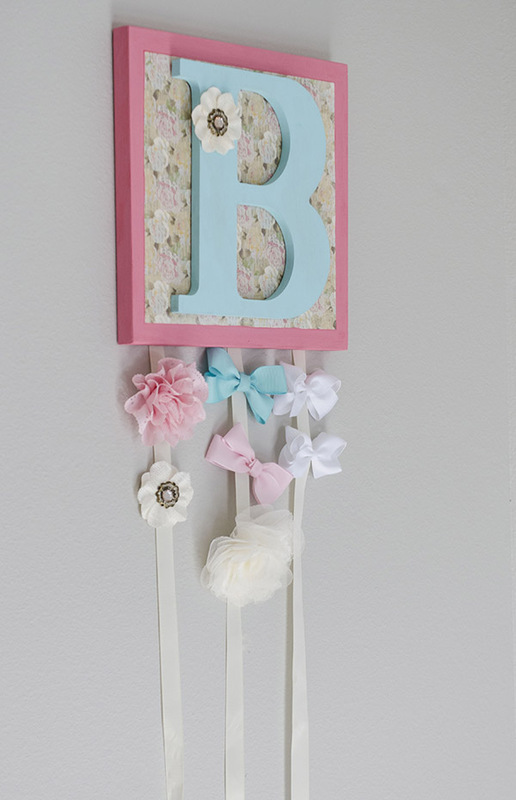 Last we added the cream flower to the "B" which we also used this same flower to make another piece of wall art. Then, we just simply clip her bows to the ribbon. Easy enough, but the most important part of the hold DIY? I let my son help me. He was able to make something special for his sister before she was even born. "I can't wait for sis to see this! She's gonna love it!" It help build the excitement of her arrival. 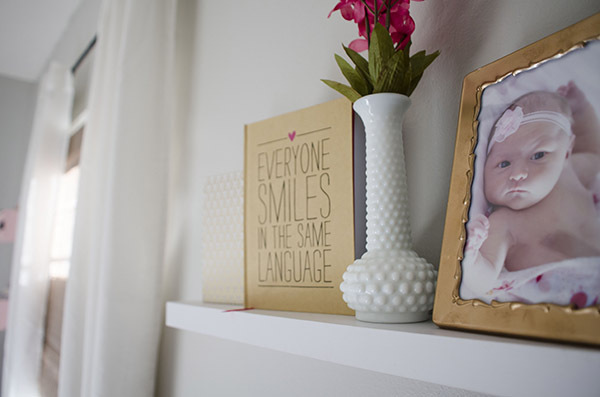 We have another vintage vase that lives on her little shelf above the chair. It's paired with a gold frame, photo album, and her special memory journal. The best part of this room? The sweet little girl that it belongs to! I feel so honored to be her mother and make a special room just for her. I'm excited to see the space evolve as her unique personality grows. In fact, I recently purchased a thrift store item to add to the space. So, when I find the time to restore it a bit I will try to post about it. And in case you are wondering where I've been lately? I've actually been working a bunch. Of course, the THREE kids are part of my MIA status. 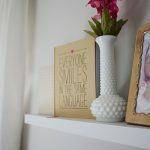 I've had several design and photography projects that are keeping me busy (plus I've been redesigning my business website/blog) --- and when you are a SAHM and own your own small business you just do what you gotta do! Pictures of InteriorFunNurseryDesign5 is created to be the inspiration of for you. This image was published on February 7, 2019 and published by Dilma Russo this is fall into the category Uncategorized, the size of image is 600 x 906 and this post has 7 related images. If you have any questions please Contact Us. Hope it could inspire you, our beloved reader in graficalicus.com, back to article please click Girls Nursery. Here we have 7 great photos about Girls Nursery. We hope you enjoyed it and if you want to download the pictures in high quality, simply just click the image and you will be redirected to the download page of Girls Nursery.